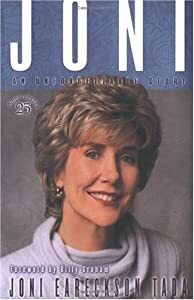 Joni’s story is familiar to many, especially Christians. Born in 1949, a diving accident in the Chesapeake Bay in 1967 left her a quadriplegic, paralyzed from the shoulders down. Her struggle with pain and depression as she learned to accept the reality of her future is told in her autobiography, JONI (1976) and JONI (1779), the feature film based upon it. Her public life and ministry since then is well known. She founded a Christian ministry, Joni and Friends, devoted to providing practical and spiritual support for individuals suffering with disabilities of various kinds and their families. Over the years she has authored 48 books, including 2 award-winning children’s books. She has made too many public appearances to count, and used every form of media to bring comfort and encouragement to those suffering and understanding to those of us more fortunate. In 1982, Joni married Ken Tada. All sorts of questions now flooded the minds of her admiring public. Why? Why would a healthy, athletic man marry a woman, a very beautiful woman, but a woman in a wheelchair? What sort of life can they have together? How will he be able to deal with her disability day after day, year after year? How will he be able to deal with her inevitable periods of depression, providing encouragement and strength rather than pity? In short, what will their life together be like, when they don’t have to be always smiling and cheerful in front of the cameras? JONI & KEN: AN UNTOLD LOVE STORY is the story of an enduring love, a love based upon commitment to one another, and most importantly, a commitment to Jesus Christ, the one who has promised to be our rock, and the one who is ever faithful to his promises. I typed that line at the top of the page. Then I leaned back in my chair and just stared, stared at the sheet of white paper peeking out from the top of the typewriter, mocking me. I tore the page from the typewriter in frustration and anger, crushed it into a ball and tossed it in the direction of the waste basket. It hit the wall and bounced off, missing its target to join the many other wads of paper scattered about. I reached for a clean sheet of paper and fed it into the typewriter. I turned the roller until a small portion of the virgin paper emerged above the keys. I sat up straight, took a deep breath, and prepared to type. The keys sang out: click, click, clickity-click, click . . . I was composing a short story, a great piece of literature, perhaps a great novel in its infancy. My frustration with my own lack of creativity was increasing. I folded my arms and stared down at the typewriter. I ripped the paper from the typewriter, crumpled it, and tossed it on the floor with the others, and placing a new sheet in the typewriter, I began to type. I am frightened by the thought of attempting to write fiction. Writing ordinary prose such as you are reading is something anyone can learn to do. It is all about technic, whereas fiction requires talent. Not long ago, I joined a local group of individuals interested in writing. They call themselves the “Clinton Ink Slingers.” The purpose of the group is to encourage each other by gently critiquing each other’s writing. Shortly after joining the group, I tried my hand at writing a short story. I even took a chance and posted it on my blog. A few individuals read it and complimented me on it, but they were mostly friends, relatives, and members of the Clinton Ink Slingers. I have written books, all of them history books. Most are read by students forced to slug through them by a frustrated and disillusioned professor ever on the quest for the perfect text dumbed down enough to hold, however briefly, the limited attention span of today’s “young scholars.” My use of “young scholars” is a humble attempt at sarcasm. I do not think there is a textbook on the market with enough bells and whistles to draw the average student away from his or her iPhone for more than a fleeting moment. What started me thinking about writing and my dream of one day writing a novel are several things. The first was a visit to the grave of F. Scott Fitzgerald and his wife, Zelda, in a small church cemetery in Rockville, Maryland. One of the priests at the parish church assumed I was just another of many pilgrims who stop by from time to time. One such pilgrim who preceded me left an empty wine bottle, two mini whisky bottles, also empty, a single red rose, and a hand written letter to Scott and Zelda. Finally, it was 87 years ago that the Book-of-the-Month Club was born. Its first selection was LOLLY WILLOWES by Sylvia Townsend Warner. It is an early feminist novel about a woman who sells her soul to the devil, and in return becomes a witch. The novel is still in print. There is even a Sylvia Townsend Society which seeks to keep interest in the too often neglected author. The Book-of-the-Month Club was the creation of Harry Scherman, Max Sackheim, and Robert Haas. At a time when books were sold through bookstores in urban areas, Scherman looked for a way to sell books to people in rural areas. Scherman was a member of a group of bohemian intellectuals living in Greenwich Village during and after World War I. They had in common a love for fine literature and the desire to find a means of marketing books to the literate masses beyond the big cities. The first Book-of-the-Month Club selection, LOLLY WILLOWES, was mailed to 4,750 members in April, 1926. Membership rose to 46,539 by the end of the year, and stood at just under 100,000 in 1928. Record numbers continued over the decades. In 1946, the club mailed its 100 millionth book. More than 22 million books were shipped to over 3 million members in 1993, alone. A book’s success was virtually guaranteed if selected by the club’s editorial board. The board’s original function was to “select the best new books each month.” Sales were important, but for many decades the editorial board selected books that were likely to endure as “literature” rather than be remembered, if remembered at all, as “best sellers.” During the board’s first sixty years the Book-of-the-Month Club offered books by 25 authors who went on to win the Nobel Peace Prize, and 79 who won the Pulitzer Prize. A case in point is J. D. Salinger’s novel THE CATCHER IN THE RYE (1951). At one point in the story, Holden Caulfield makes a disparaging remark about “guys who belong to the goddam Book-of-the-Month Club.” Salinger had no idea at the time that that “goddam Book-of-the-Month Club” would help establish THE CATCHER IN THE RYE as one of the all-time great American novels. After having sold more than 65 million copies, it remains on the shelf of any respectable bookstore or library.